Scientists from the ARC Centre of Excellence in Plant Cell Walls at the University of Adelaide have discovered that a variety of sorghum growing wild in Australia, Arun, has the potential to yield over 10,000 litres of bioethanol per hectare per year. In a study published in the journal PLOS ONE, the researchers assessed the stems of 12 varieties of sorghum for sugar content and ease of conversion to bioethanol. These included cultivated varieties and wild relatives, including Arun, which yielded significantly more bioethanol than other varieties. "Two key advantages of using stem (rather than leaves or grain) to make biofuel is that we can produce this material in low input systems; and as we do not eat this part of the plant we avoid the food versus fuel debate," says Dr Caitlin Byrt, Postdoctoral Fellow in the University's School of Agriculture, Food and Wine. Despite Arun stem containing high levels of a component thought to inhibit bioethanol production, this appears to be negated by a high level of an easily fermentable sugar. 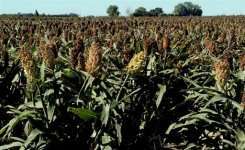 The researchers say that a large pool of untapped diversity exists in other species and subspecies of sorghum which opens new avenues of research to generate sorghum lines optimised for biofuel production. Arcadia Biosciences – a Davis, California-based agricultural technology company – is a partner in the Centre's research and is working with the Centre to commercialise these findings. "Commercial application of this work could easily extend to production areas outside Australia," said Raj Ketkar, Chief Executive Officer of Arcadia. "We remain keenly interested in collaborating with the Centre and other partners to explore the use of sorghum as an alternative and sustainable energy source."